Outside case back: no signature. Wheat-like engraving. Inside case back: American Standard Warranted to Assay 14K 1116334 over perlage. Case measures 23mm x 23mm, not including cabochon sapphire crown. Dial: Silver w/ black Arabic Numerals. 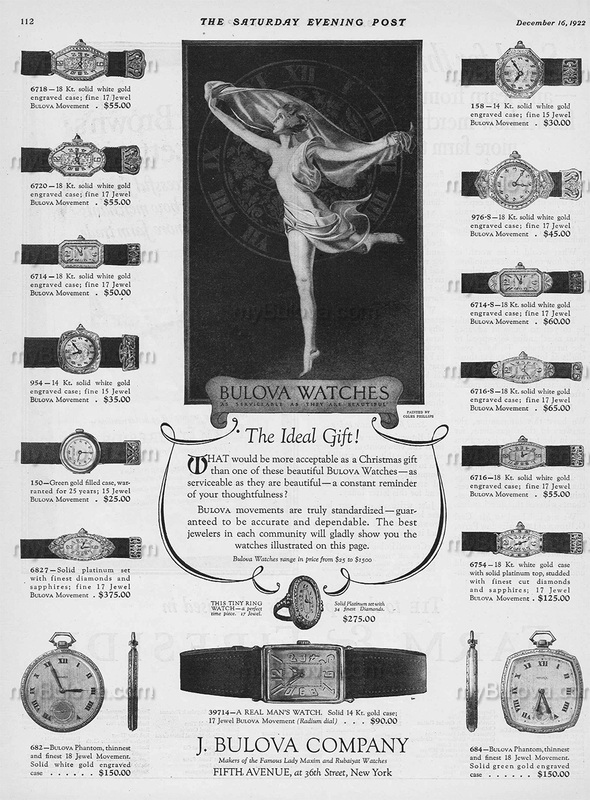 Bulova. Outter black minute chapter. Solid 14K white gold case, movement with no visible date symbol? Single hinged case. Not my watch, but nice early example for watch database. EDITED 20120923 to change incorrect movement signature from Bulova Watch Co. to Bulova W. Co.
A guess on the production date? I hope one of our mybulova family won this watch so we can ask more questions if needed. Looks like a small marking on movement bridge next/below crown, but can't make what it may say, if anything. I don't have any more info that above and don't know who/where the actual watch ended up after auction closed last week. The eBay seller (diamondusa) was very cooperative and helpful, and happy to provide photos once the auction closed. Based on the case serial number lets go with 1921, which would be my best guess based on the movement model. This watch is in amazing condition for something that is 91 years young. Other panel member.... Your thoughts please so we can get the one published. "954" model from the new ad anyone?